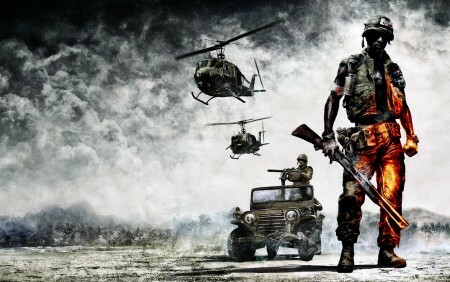 Ever since 2004’s standalone title Battlefield Vietnam, fans were eager to return to the infamous Vietnam War setting. DICE delivered it in 2010 with the massive themed expansion pack Battlefield: Bad Company 2 Vietnam. Featuring five war-torn maps and iconic weapons and vehicles from the era, the expansion pack transported players back to the 60′s with its time-typical soundtrack blasting from the vehicle radios. The fifth map in the expansion pack is a reimagining of the classic Operation Hastings from Battlefield Vietnam, unlocked in the wildly popular “Battle for Hastings” community challenge. In it, DICE tasked the community to perform a total of 69 million team play actions — the same unique Battlefield actions that have set the series apart ever since its inception.